More than seven months ahead of a typical program schedule, we fired the first GE9X engine on our testing grounds in Peebles, Ohio to ensure ample time to validate and mature its design before entry into service on the new Boeing 777X aircraft. It’s all part of our commitment to delivering confidence from day one. Tested for years. Confidence from day one. With the most extensive technology maturation program in the history of GE Aviation, the GE9X engine will deliver world-class reliability and performance at service entry. But first, components undergo rigorous testing at specialized facilities around the globe. Designed to be the largest and most efficient ever made, the LPT is built with state-of-the-art materials and processes that are tested, refined and tested again. Capable of handling the highest pressure ratios and temperatures in aviation history, the combustor required the creation of specialized testing facilities in Evendale, Ohio. See how scaled 4th-generation composite fan blades are used to validate the 16-count design – the lowest of any twin-aisle engine available. Take a look at how the compressor’s record-breaking 27:1 pressure ratio and new 3D aerodynamics are qualified on a custom-built rig in Massa, Italy. In more than a century of building engines and powering flight, GE Aviation has never stopped innovating. All those years of research, testing and development will come together to power the new Boeing 777X airplane with the all-new GE9X commercial engine, built on a proven architecture while incorporating the latest technologies and materials. 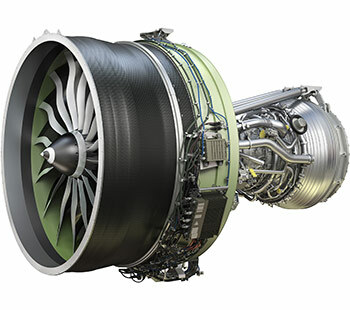 A blend of evolutionary and revolutionary designs will enable the GE9X to be the most fuel-efficient jet engine GE has ever produced on a per-pounds-of-thrust basis. It’s designed to deliver a 10% improved aircraft fuel burn versus the GE90-115B-powered 777-300ER and a 5% improved specific fuel consumption versus any twin-aisle engine available, plus achieve an approximate 10:1 bypass ratio, a 60:1 overall pressure ratio and margin to Stage 5 noise limits. The advanced materials, coatings and aerodynamics in the GE9X engine will be validated through GE Aviation’s most extensive technology maturation program ever. As part of this commitment to testing and design iteration, the GE9X will benefit from more than 14.5 million ground, flight and in-service cycles of cumulative experience across our engine portfolio, validating design and technology prior to service entry. The years of testing will provide multiple proof points of the GE9X’s technical and manufacturing readiness from day one. Designed specifically for the Boeing 777X airplane, the GE9X will be the most fuel-efficient jet engine GE has ever produced.